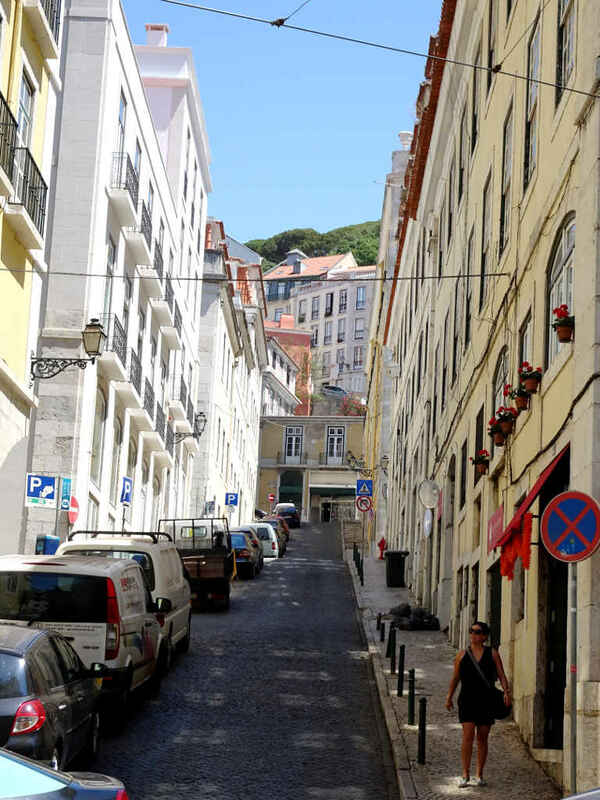 It’s a long, steep climb up from the river, through the narrow winding streets – some of them stairs – of the Alfama. 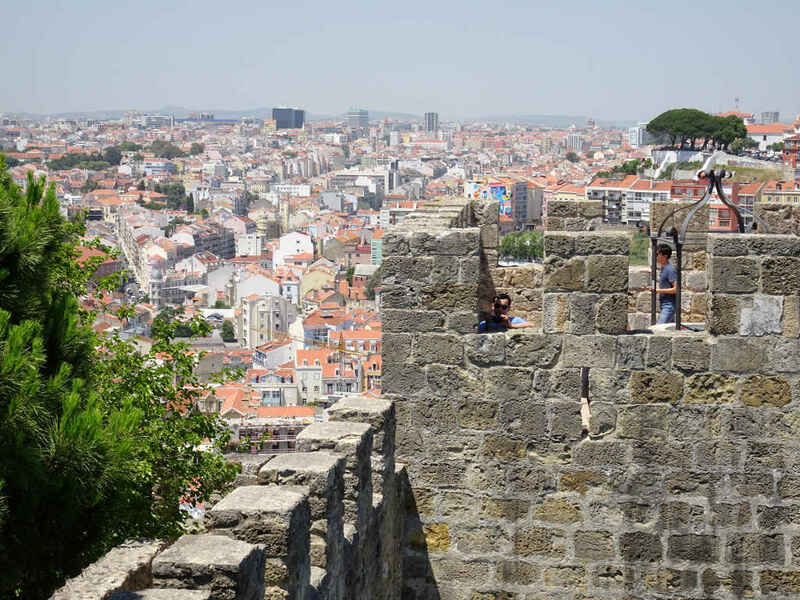 Up, up to the highest battlements of the Castelo de Sao Jorge – Lisbon’s Castle of St George. You need to stop at times on the way. Stand in the shade of a wall. Sit for a glass of fresh pressed orange juice or a cup of coffee. Feel the heat and the history radiating from the walls and the streets’ mosaic paving. You can see why these heights were attractive: easy to defend, hard to take. They command the mouth of the River Tagus – the Tejo – and the harbour below; the routes out to the Atlantic in one direction, inland to Iberia in the other. 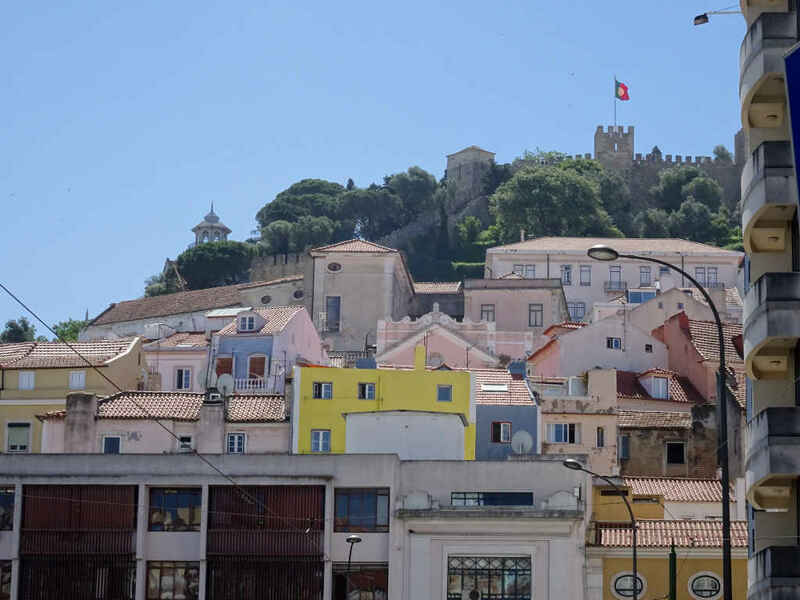 The castle was built by Portugal’s Moorish rulers in the 700s, though the archaeology confirms previous fortifications from Roman, Carthaginian and pre-historic times. From the 700s to the 1100s the castelo grew, and the city it protected. By 1147 it was, if not impregnable, certainly a tough challenge. At that point the Reconquista – the Christian re-conquest of Islamic Iberia – had been underway for a good 300 years. The current local leader was Dom Alfonso, Count of Portugal. The Count’s army wasn’t bad, but it wasn’t up to the challenge of Lisbon’s fortifications. The Second Crusade was underway. The Pope in Rome had given the Catalans, Castilians, and Portuguese dispensation to fight their own fight at home. He summoned everyone else to spill blood in the Holy Land. An armada of ships from around the English Channel and the North Sea collected and sailed from Dartmouth in England. Figures differ, but there may have been upward of 160 ships. They ran into bad weather and put into Oporto where Dom Alfonso seized the day. He persuaded this motley gang of bruisers – sorry, army of noble knights – to stay and besiege Lisbon. In keeping with their Christian faith, they drove a hard bargain. Dom Alfonso had to agree to let them hold the city after they had captured it. Just for a period. Just until they had taken everything of value they found and all the ransom they could squeeze from their prisoners. Don Alfonso also promised them feudal estates in the territories they captured if they chose to stay. They wouldn’t have to pay taxes either. The siege began on 1st July 1147 and ended on 25th October. The castle was starved into submission, though later Portuguese mythology gave the credit to a Portuguese knight, Martim Moniz. The story is that Moniz saw the Moors had left a door open (because after a four-month siege the defenders would certainly be careless enough to open a door). He forced himself into the doorway, sacrificing his own life to stop the Moors closing it. His heroism allowed time for his comrades in arms to reach him and break through the doorway to capture the castle. In fact the defenders negotiated a surrender which would allow them to leave the castle with their lives and goods intact. Once in possession the Crusaders reneged on this agreement. Afterwards, while some Crusaders sailed on to Palestine and the otherwise unmitigated disaster of the Second Crusade, others stayed. One English knight – Gilbert of Hastings – became the Bishop of Lisbon. No doubt his holy work during the siege had qualified him for the job. Gilbert’s Cathedral – Sé de Lisboa – was constructed on part of the ruins of the city after the siege. 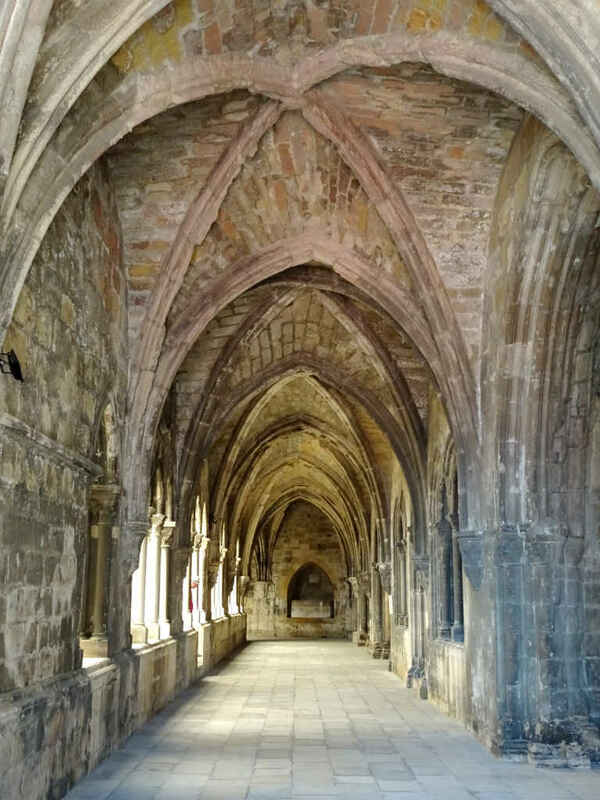 An archaeological excavation under the Cathedral’s cloister reveals Moorish, Roman and earlier remains, and the site is open to the public. Mrs SC and I stopped there on our climb to the castle and looked into the depths of history. A blackbird was singing in the excavation and then it flew down and under the arch of a Roman sewer where, presumably, it had a nest. Up on the battlements, when we finally reach them, the limestone of the walls is weathering. I can see fossilised mussel shells and the imprint of clams created millennia ago. 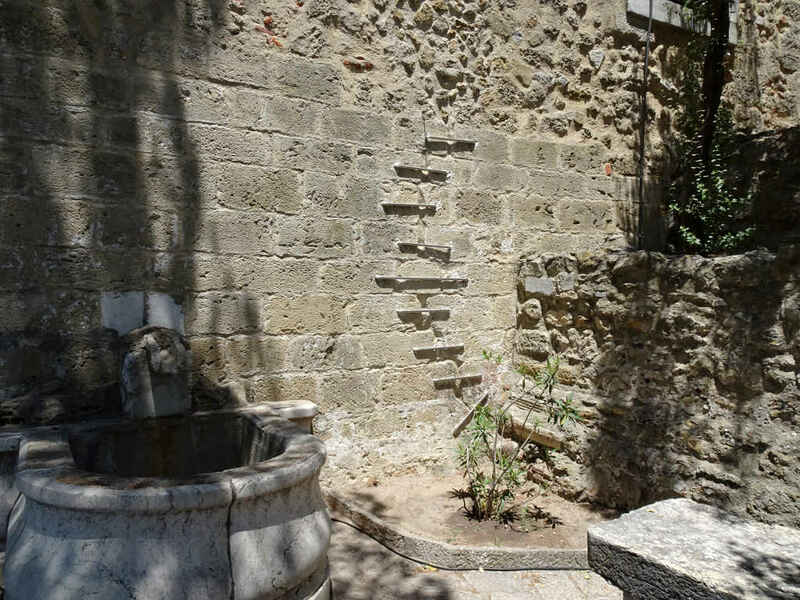 Along one of the castle’s lower, broader shoulders pines in the hot sun scent the air. Hollow and decayed trunks of olive trees, looking old enough to remember the siege, yet sprout twigs with small bunches of grey-green leaves. There’s life in the old wood yet. A few words of extra information. My account of the Crusaders capturing Lisbon depends to some extent on Wikipedia, to some extent on accounts available at Castelo de Sao Jorge and to some extent on the eye-witness account by Osbernus De expugnatione Lyxbonensi (The Capture of Lisbon) at the Medieval Sourcebook. I should probably add that by 1147 Dom Alfonso was recognisd by his own people as King of Portugal, but not by any other state or ruler. It wasn’t till 1179 that he managed to finesse his achievements in the Reconquista into Papal recognition as the first King of Portugal. I originally published this article on the separate Stops and Stories website. Transferred here with a little polishing for SEO and a new featured image – got up to look like a painting to hide the fact that it’s a bit out of focus – on 4 July 2017. The Steve McCurry photo exihibition at the Brussels Bourse in 2017. A belated photo essay, review and meditation on the ethics of photography. The Gothenburg disco fire: the worst fire in recent Swedish history took place 20 years ago on the 29th October 1998: 63 died, over 200 were injured. Cook and Book in Woluwe-Saint-Lambert: it's a bookshop and a restaurant, a café and jazz venue. And did I mention it's a bookshop? Back in Brussels for a photo catch-up and an attempt to round off my Brussels years, I don't quite manage, but I do get a lot of pretty decent photos.